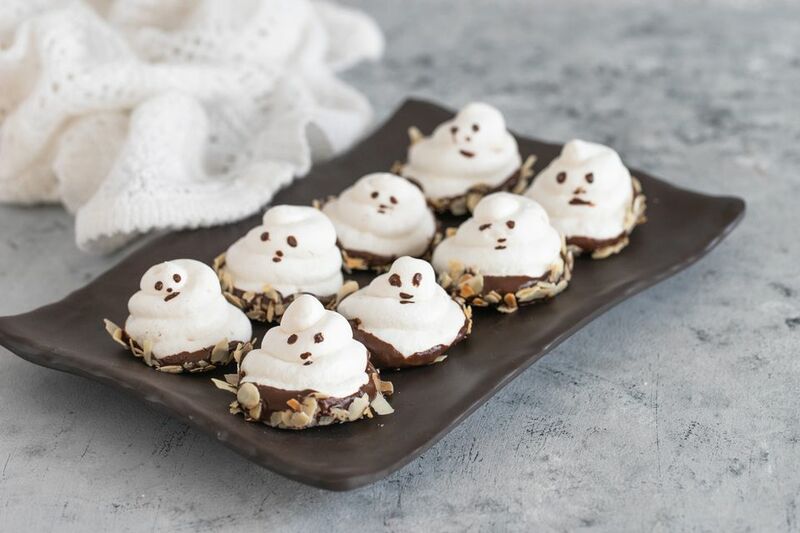 These ghoulish figures are actually fluffy-on-the-inside, crispy-on-the-outside meringues dipped in chocolate and formed into Halloween-worthy treats. You can flavor the meringue with any extracts you like—vanilla and almond are classic, but mint, orange, lemon, and others also work well. They should include some flavoring, because meringues don’t have much flavor otherwise. You can also boost their taste by getting creative with the crunchy toppings. Toasted nuts, coconut, sprinkles, and chopped candy bars are all great options. Gather the ingredients and preheat the oven to 200 F.
Turn the mixer to medium-high speed and beat until the egg whites are foamy. Switch the mixer off, add the cream of tartar, and continue beating on medium-high until the whites have turned an opaque white color and hold soft peaks. At this point, start adding the powdered sugar a few spoonfuls at a time with the mixer running. Once all of the sugar has been added, add any extracts you're using and turn the mixer to high speed. Continue to beat the egg whites until they are very thick, glossy, and a shiny white color. When you stop the mixer and lift the whisk out of the whites, the whites should have a very stiff peak. This process will take about 7 to 12 minutes in a stand mixer. Cover two baking sheets with parchment paper. Scoop your meringue mixture into a piping bag fitted with a 1/2-inch round tip. If you don’t have one, fill a large Ziploc bag with a 1/2-inch hole cut in the corner. Pipe your meringue into ghost shapes about 1 1/2-inches wide and 2-inches tall. You can either do this by squeezing the bag and pulling up gradually, making one big “blobby” ghost, or by making a series of concentric circles spiraling upward. Pipe 12 ghosts onto each baking sheet, for a total of about 2 dozen meringue ghosts. Bake the meringues in the preheated oven for an hour. After an hour, open the oven door and continue to cook for 30 minutes, then turn the oven off, close the door and allow the meringues to sit until completely cool, about 1 hour. Once the meringues are crisp and room temperature, melt the chocolate in a microwave-safe bowl, stirring after every 30 seconds to prevent overheating. If you want to coat the bottoms in crushed nuts, sprinkles ​or toasted coconut as well, place those toppings in small, shallow bowls nearby. Dip the bottoms of the ghosts in the melted chocolate and scrape the bottoms against the lip of the bowl to remove excess chocolate. If you’re dipping them in other toppings, immediately press the bottom of the ghost into the bowl of toppings so they adhere to the wet chocolate. Place the dipped ghost back on the baking sheet and repeat with remaining ghosts and chocolate. Dip a toothpick in the remaining melted chocolate and give each ghost two dots for eyes and, if you desire, a mouth or other features. Refrigerate the ghosts to set the chocolate, about 5 to 10 minutes. Do not refrigerate them any longer than absolutely necessary as they will absorb moisture from the refrigerator and lose their crispness. Store Meringue Ghosts in an airtight container at room temperature.